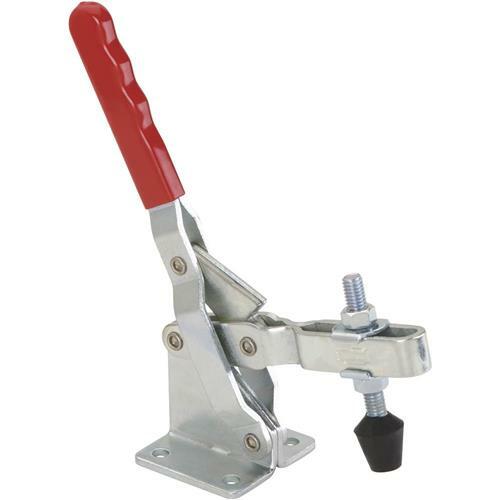 Clamp Down Type Quick Release Toggle Clamp - 6" x 8-1/2"
Grizzly G1774 - Clamp Down Type Quick Release Toggle Clamp - 6" x 8-1/2"
These quick-action toggle clamps are extremely useful for bench-mounted jigs and special jigs for machinery.Specifications:Action type: clamp downHolding force: 792 lbs.Handle position when locked: upSize: 6" x 8-1/2"
These quick-action toggle clamps are extremely useful for bench-mounted jigs and special jigs for machinery. I've used this product a number of times to clamp aluminum parts to red oak fixtures for cutting and drilling. The clamps always work great and have never had a problem with them.